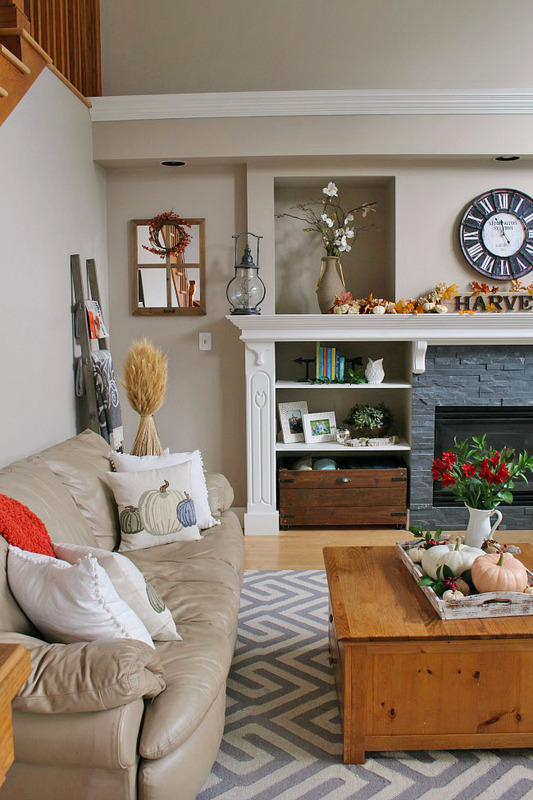 Transition your summer living room into fall with these gorgeous fall living room decorating ideas! 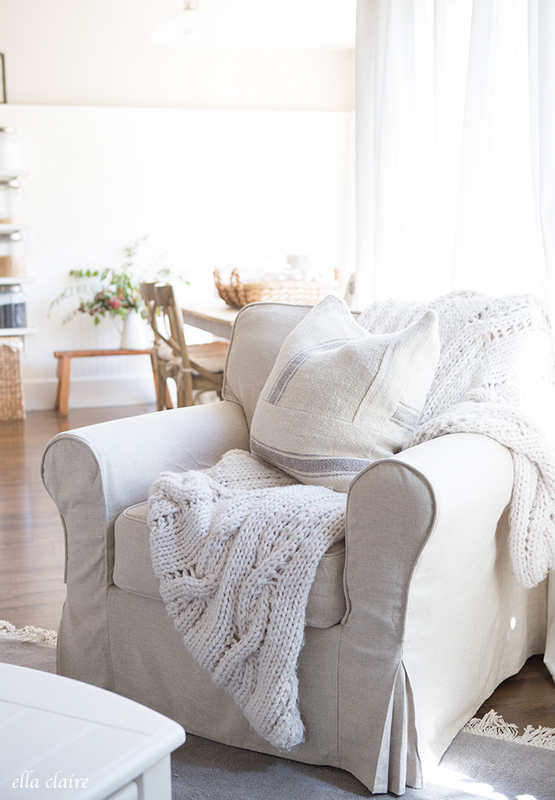 Transitioning your living room decor from summer to fall doesn’t require a complete decorating overhaul. 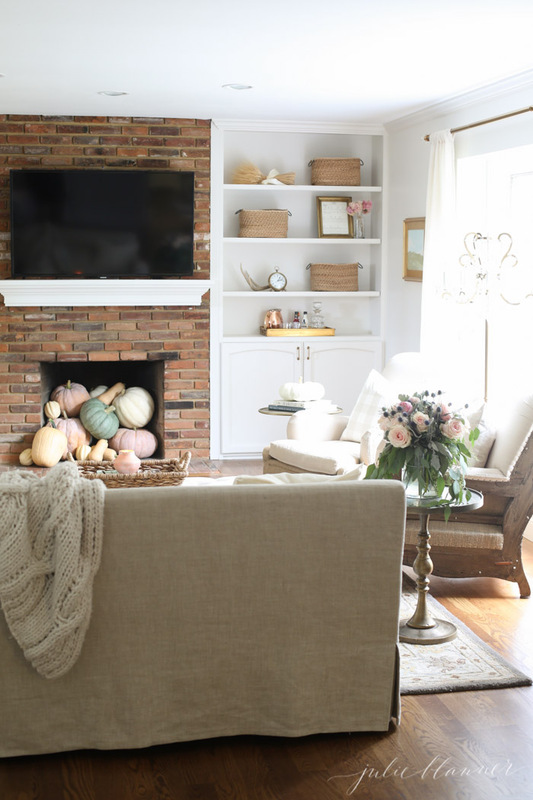 See how these 35 bloggers decorate their living rooms for fall using subtle natural elements and pops of fall color! 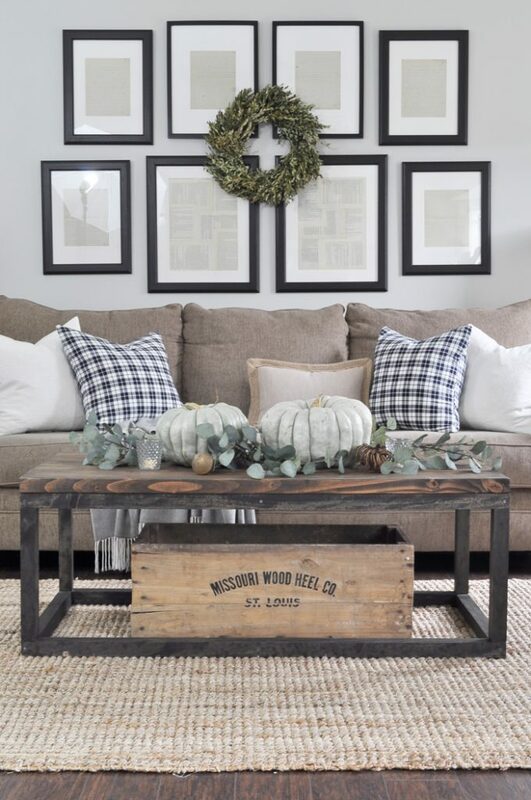 Click the blue/gray links beside your favorite pictures to see the more of their fall decor ideas. 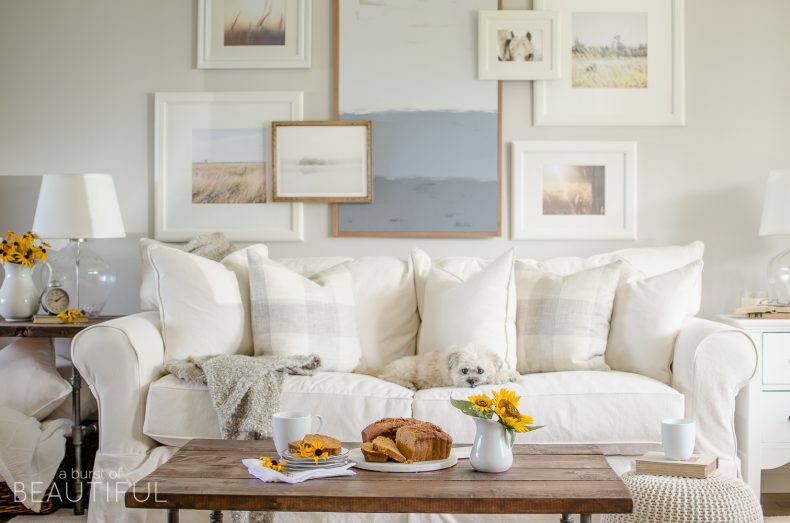 All of these bloggers have amazing fall home tours! Enjoy! 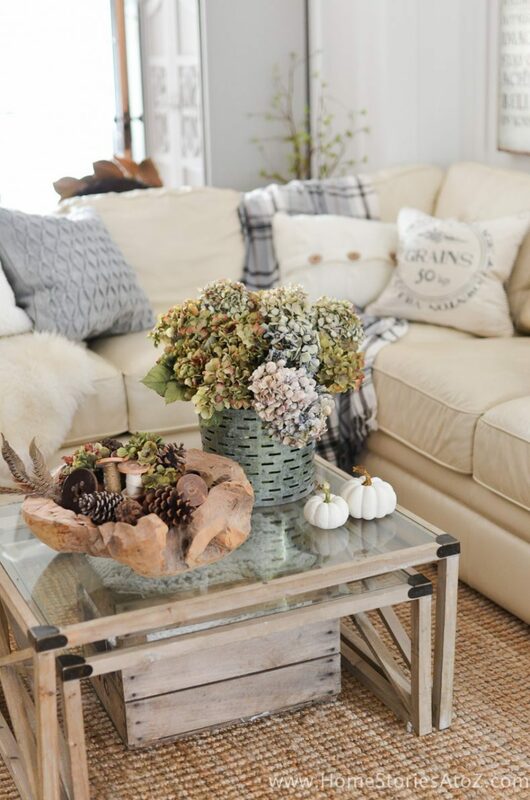 Using dried hydrangeas and pinecones is my go-to trick for easily and affordably transitioning between the seasons! 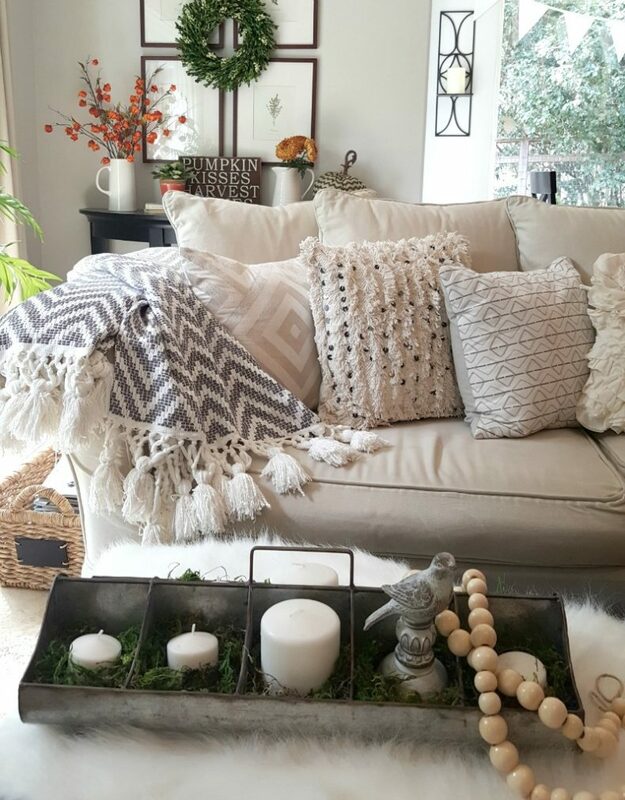 Seasonal toss pillows, some fall accessories, and a few pops of color create the cozy feeling of fall without much fuss! 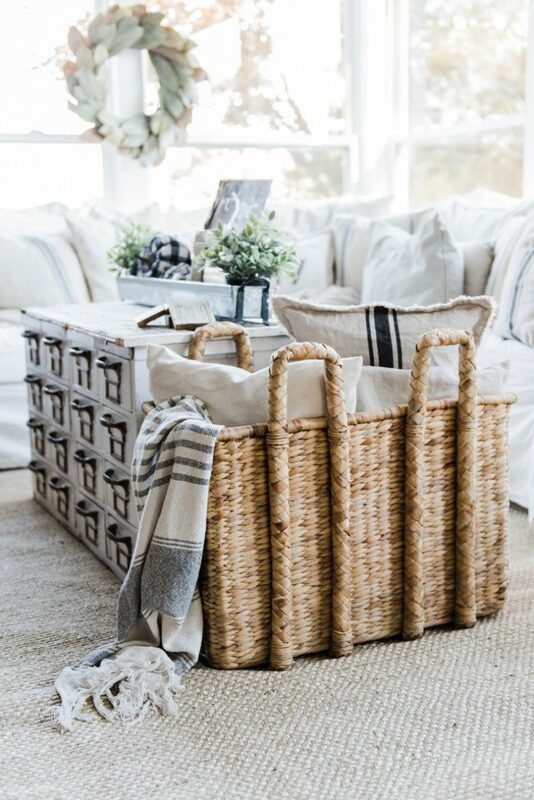 Loading a basket with cozy throws and extra pillows is a fun way to add texture to your family room. Fabric pumpkins that match your decor are a fun nod to the season! 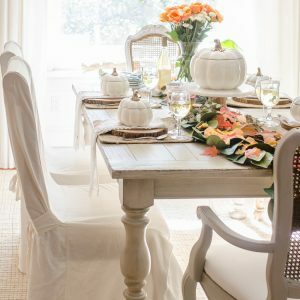 I love using fall elements in a neutral, instead of traditional, color palette. These colors are gorgeous for fall! 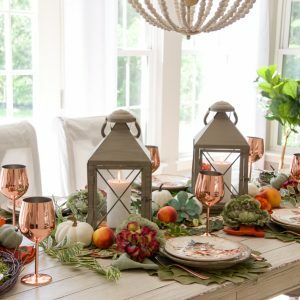 This is a gorgeous example of how to transition from summer to fall with just a few seasonal accessories! 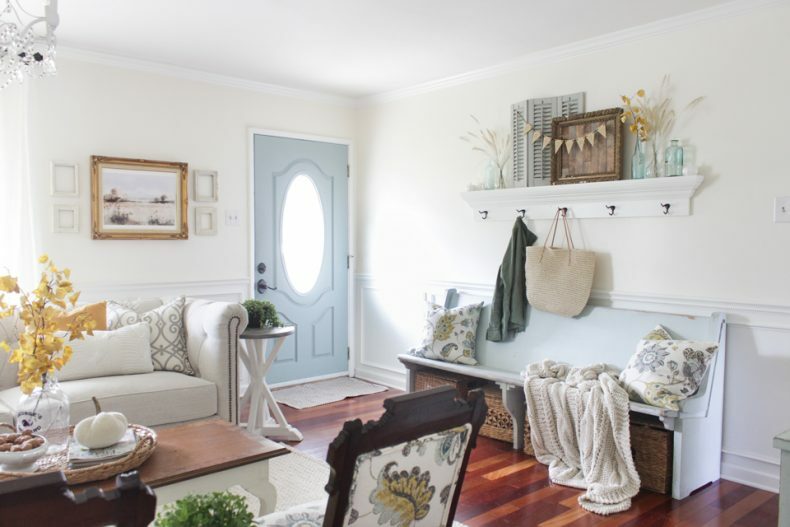 Adding cozy texture in hues of blues, grays, creams, and greens is a gorgeous way to welcome the season. I’m not sure I have ever met a white pumpkin that I didn’t adore–or a chesterfield sofa for that matter! 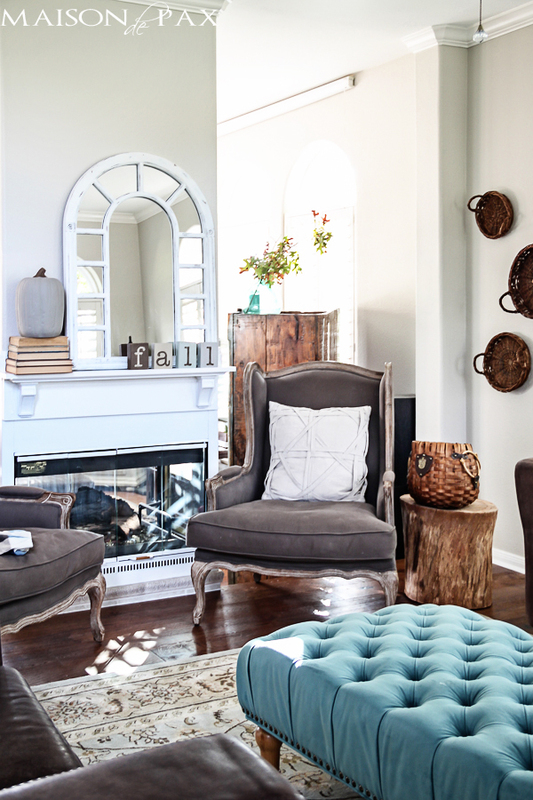 Velvet pumpkins, a cozy knit throw, and a few glowing candles are all it takes to bring touches of fall to this space. Add some baby orange pumpkins and fall leaves and call it a day! Or just add some all green pumpkins and leaves and call it a day! You just can’t go wrong. 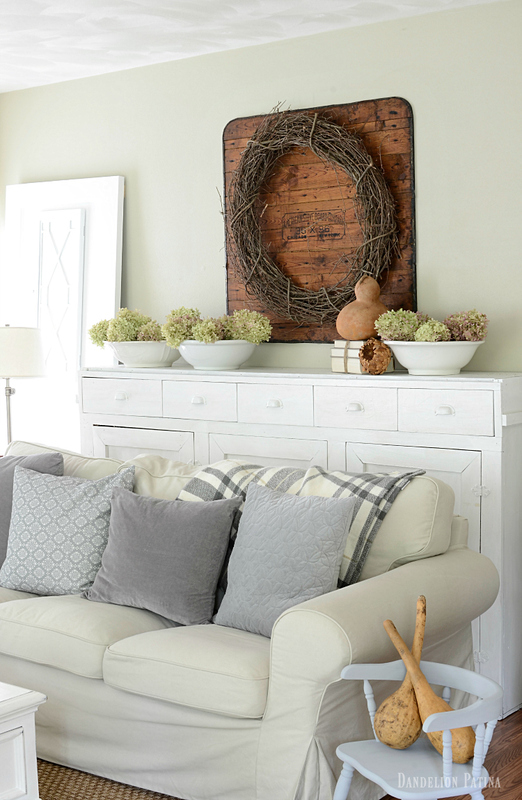 Dried hydrangeas in bowls look great year round but are always an easy way to add some fall charm to your mantel. 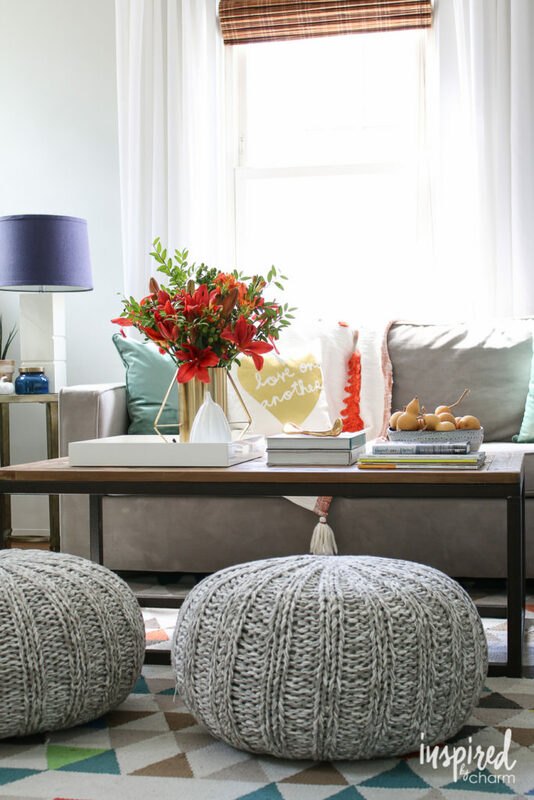 These poufs are so fun and lively and add amazing fall texture to the space! 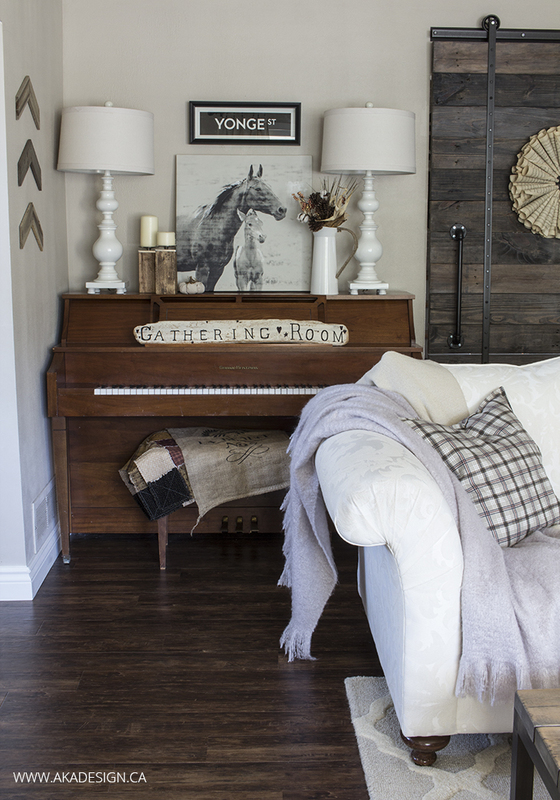 When in doubt, use tone on tone to build gorgeous and luxurious fall texture in your family room. 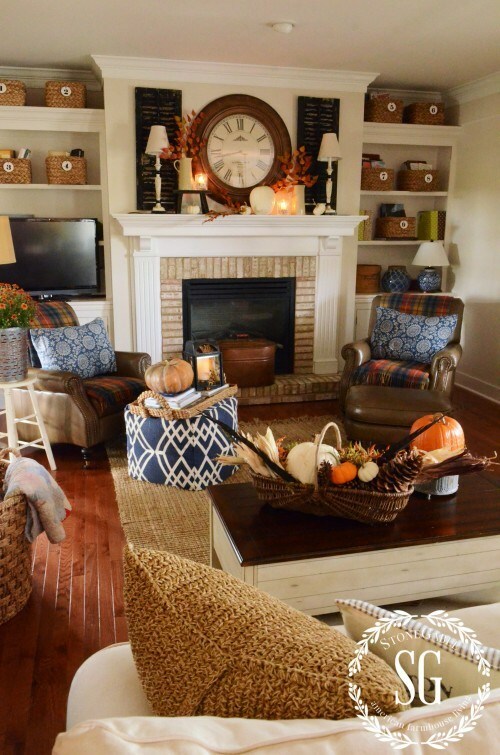 I added a few pumpkins and hydrangeas to create a fall family room that utilized my existing summer blue decor. 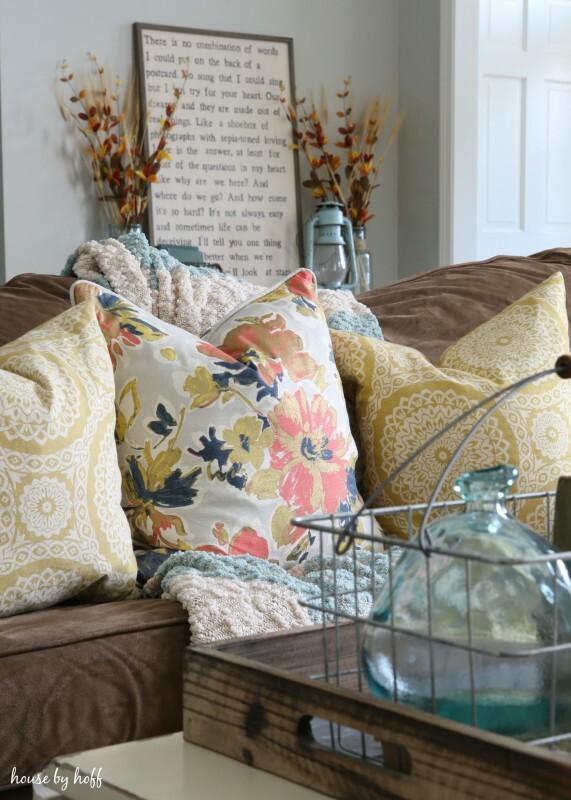 All you need is a throw blanket, a few seasonal branches in a pitcher, a good book, and a cup of tea to bring autumnal cheer to your family room! 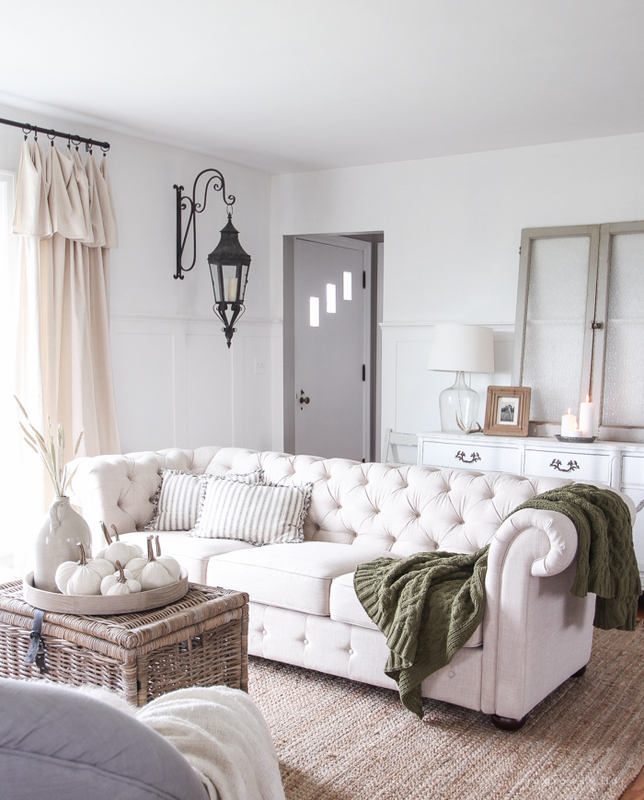 Perfect accessories for a neutral palette make this room beautiful! 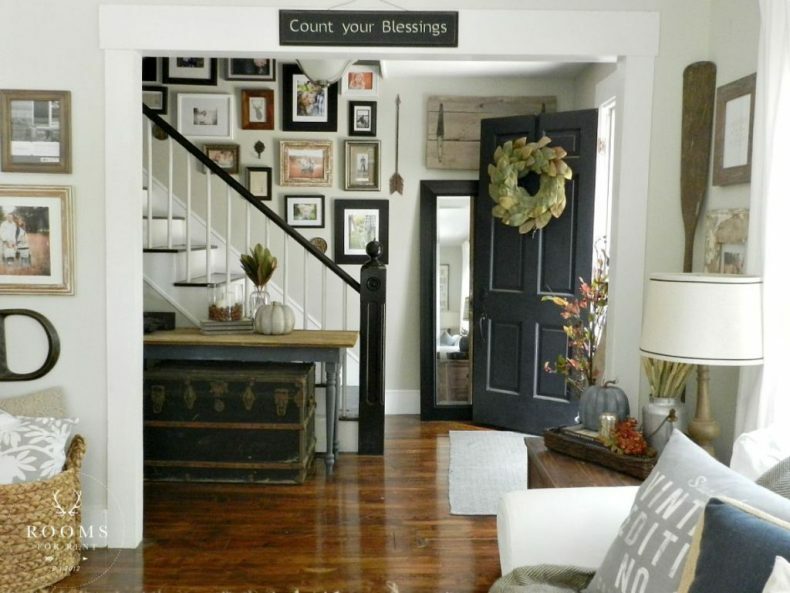 A welcoming message on a chalkboard is the central focus of this room and is an easy idea to replicate in your own home. Look at those cute pumpkins tumbling out of the fireplace! 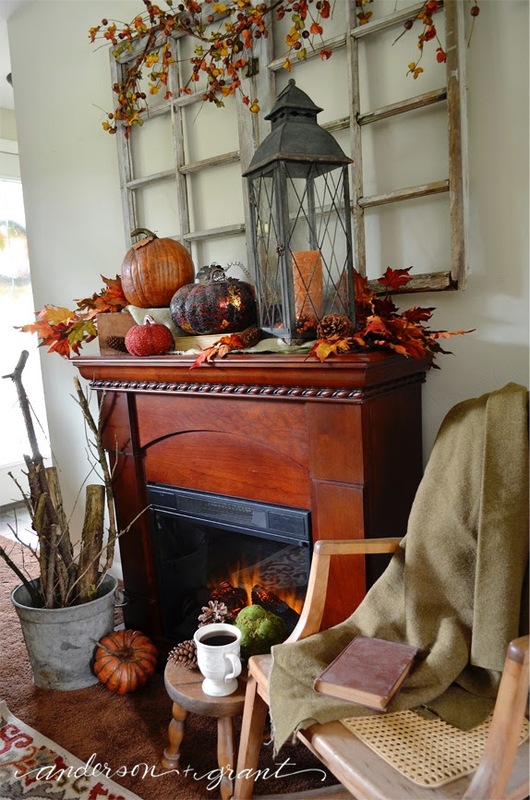 I love this idea for creating a lovely fall focal point. 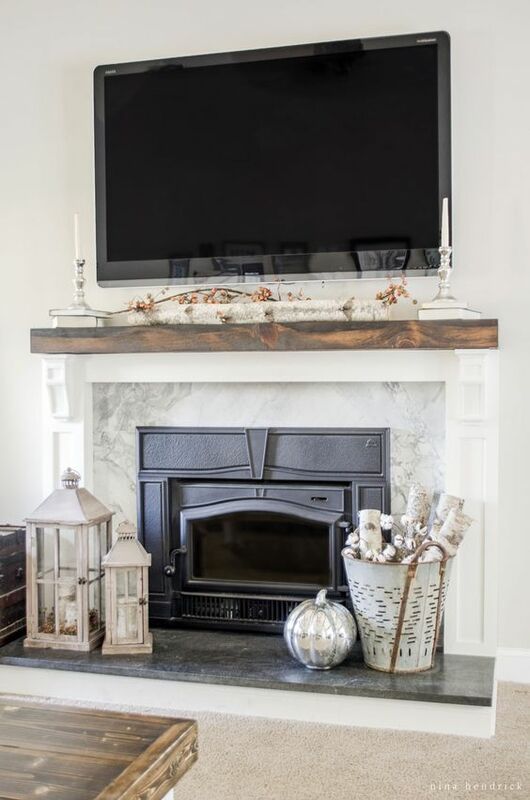 What a lovely mantel in traditional fall colors! 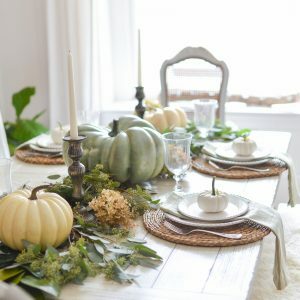 Faux pumpkins, branches, and pinecones allow you to add touches of fall quickly and easily to any vignette. 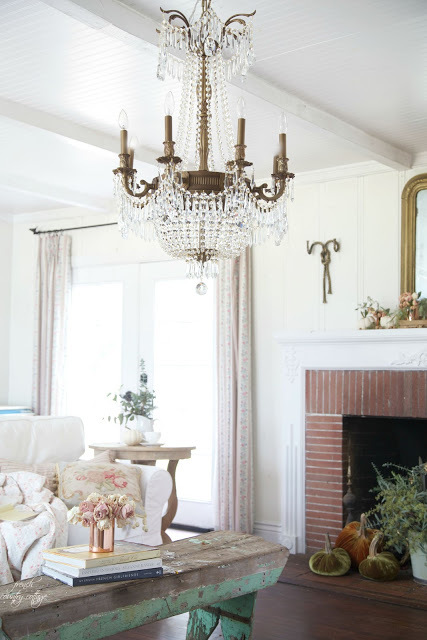 Have a fireplace above the mantel? 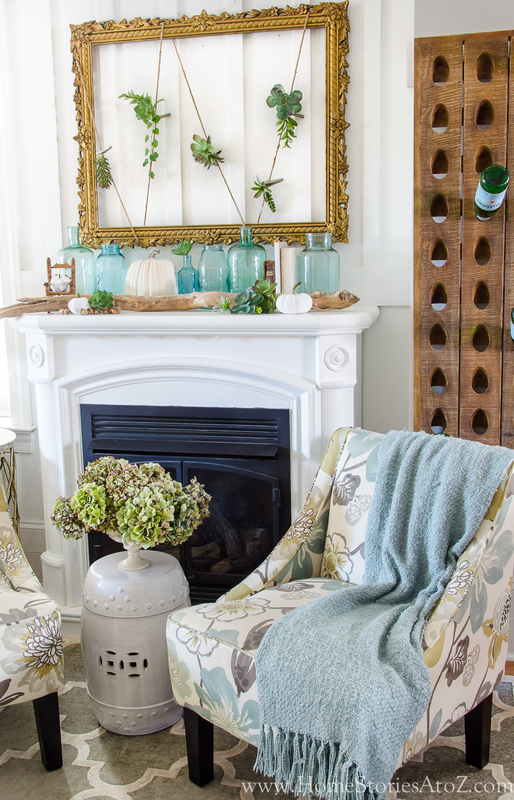 A few rustic accessories are all you need to create a cozy vibe. This is from the living room looking out, but I couldn’t stop myself from adding it! So gorgeous. 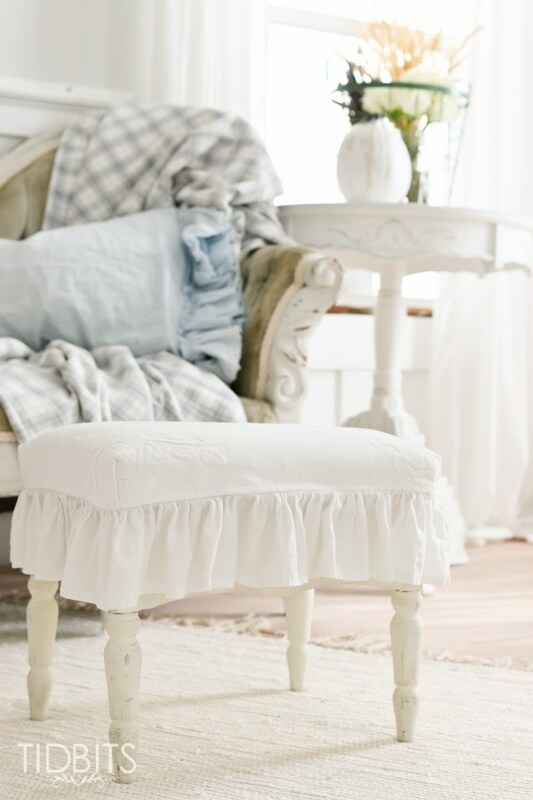 You had me at teal ottoman! 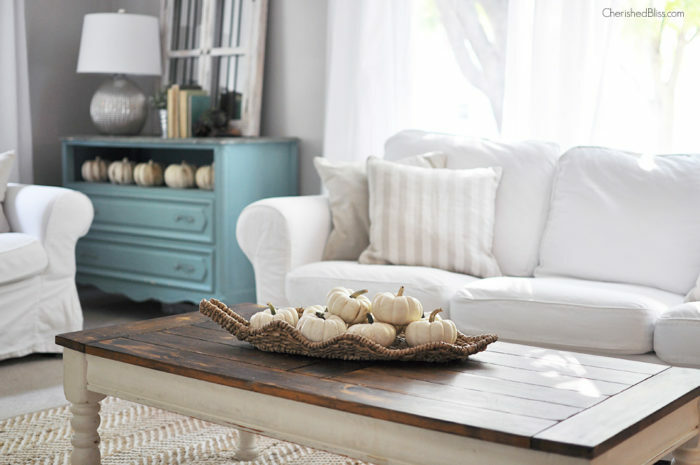 Notice how the few subtle nods to the season are all you need to create a gorgeous fall living room. 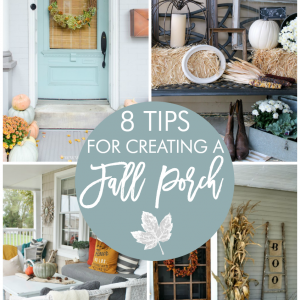 Although mustard, coral, and blue are not traditional fall colors, you can see how gorgeous they look with a few well-placed fall accessories! 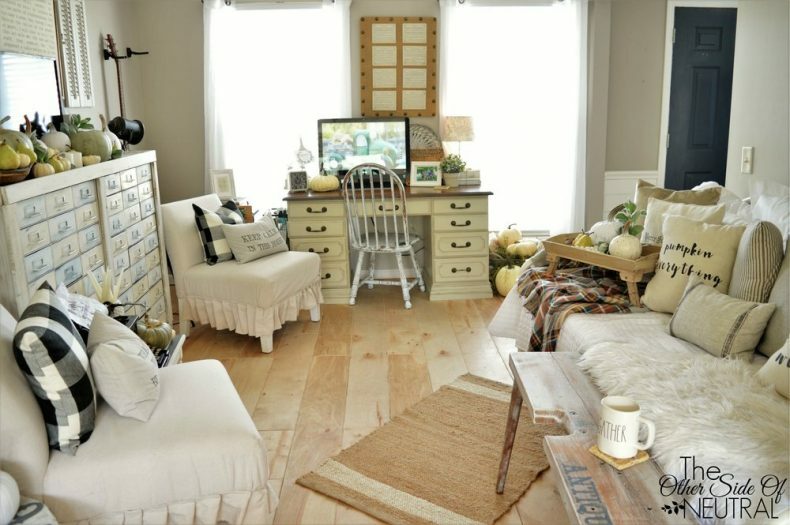 A simple and lovely fall room! 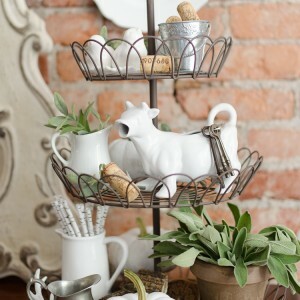 Rustic and beautiful always works! 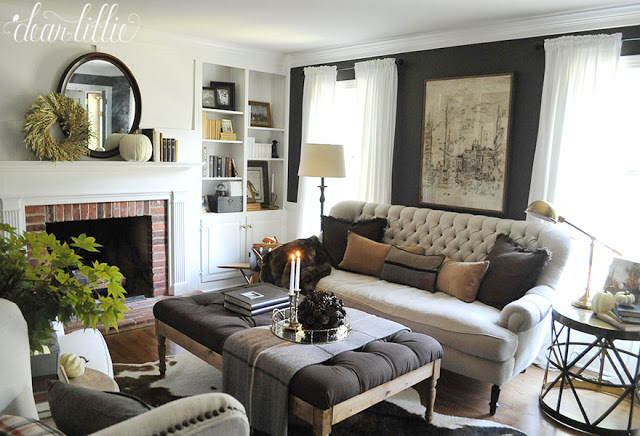 And of course a classic fall palette is always welcoming! 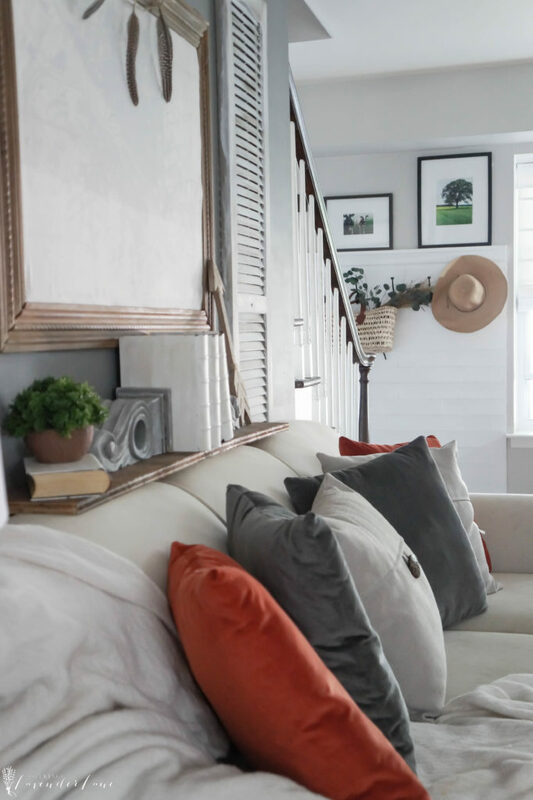 Velvety orange is the perfect color pop in this room! 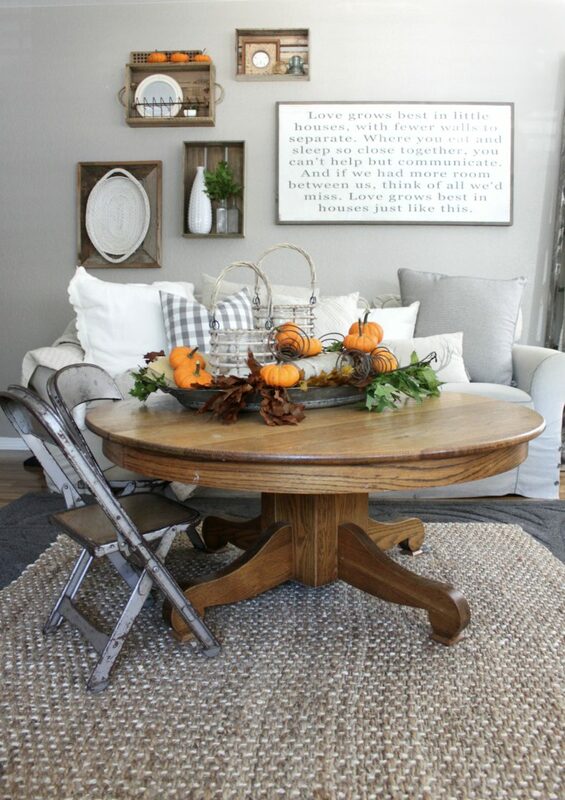 A cute sign, faux pumpkin, and branches are the only obvious fall accessories in this room and they are all that is needed! 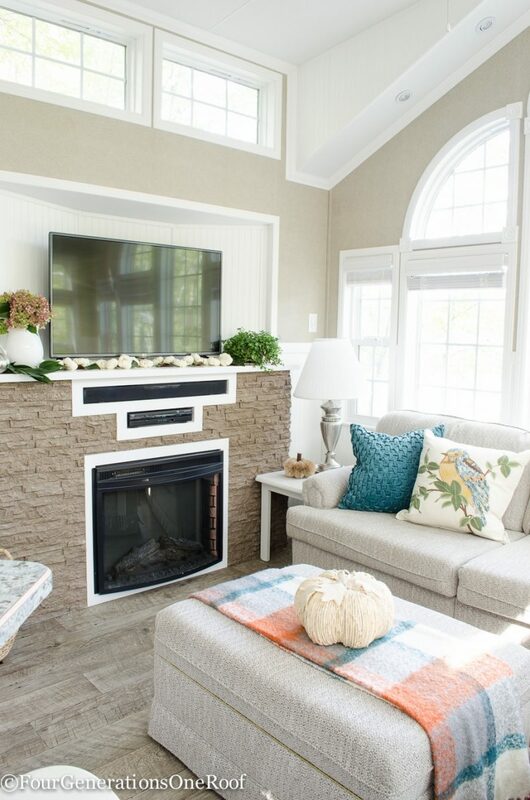 Here is another beautiful example of how to transition your family room slowly from summer into fall! 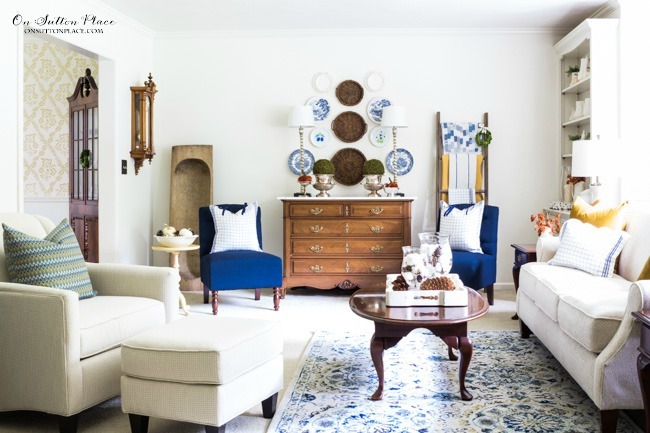 A few gourds, pinecones, and pop of mustard transition summer blues into a new season. 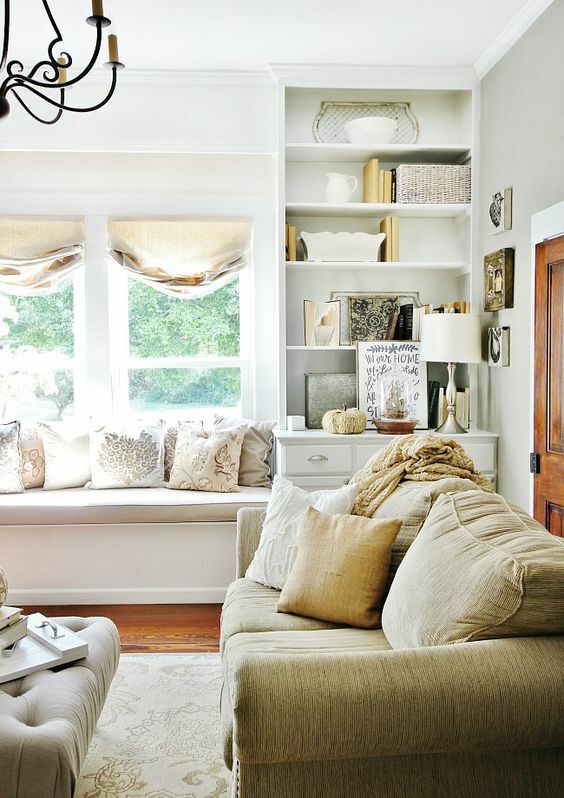 Using toss pillows in tones of brown transition your space into a warm, cozy, and gorgeous den! Velvet pumpkins, greenery, and roses are the perfect mix of summer and fall! 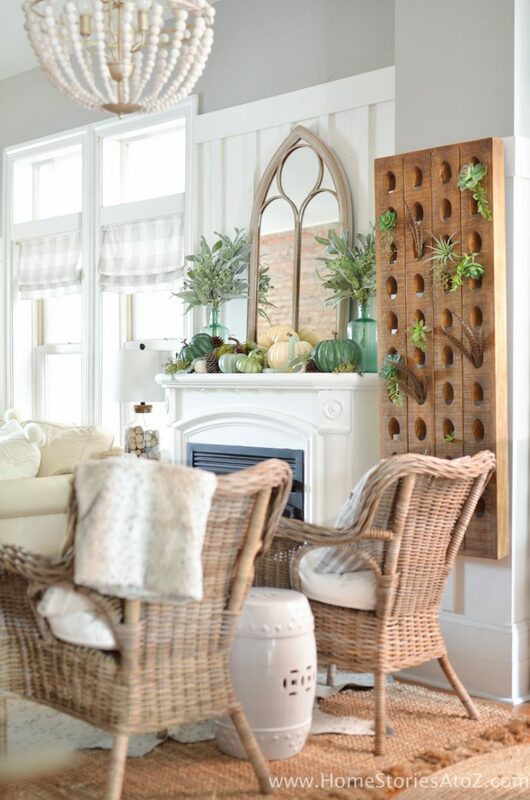 This is a unique and glamorous way to add just a whisper of the season to your space! Succulents, feathers, and pumpkins in shades of green create a fun display for fall! 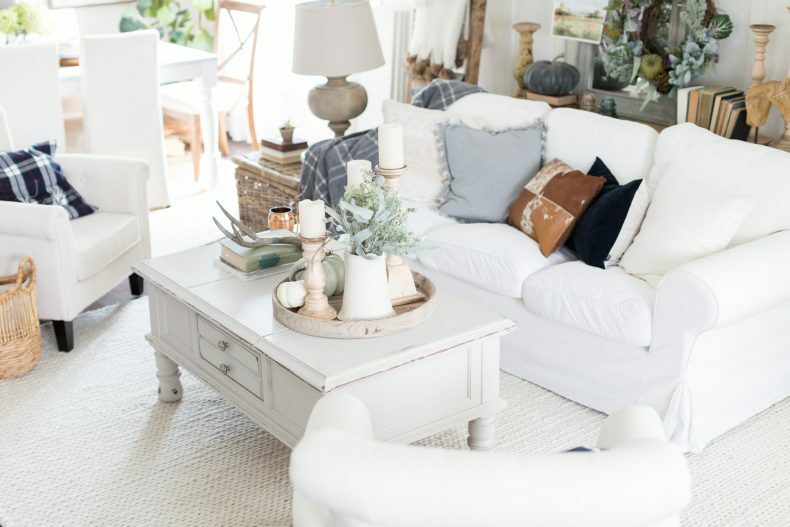 I am so happy to see the addition of a few soft shades to all of the white white white! Don’t get me wrong, my own home is mostly white, but autumn seems to call for at least a little bit of color. So refreshing! Thank you! Transitioning from Summer to Fall has so been on my mind the past week, thank you for all of the gorgeous inspiration Beth!! Gorgeous round up! 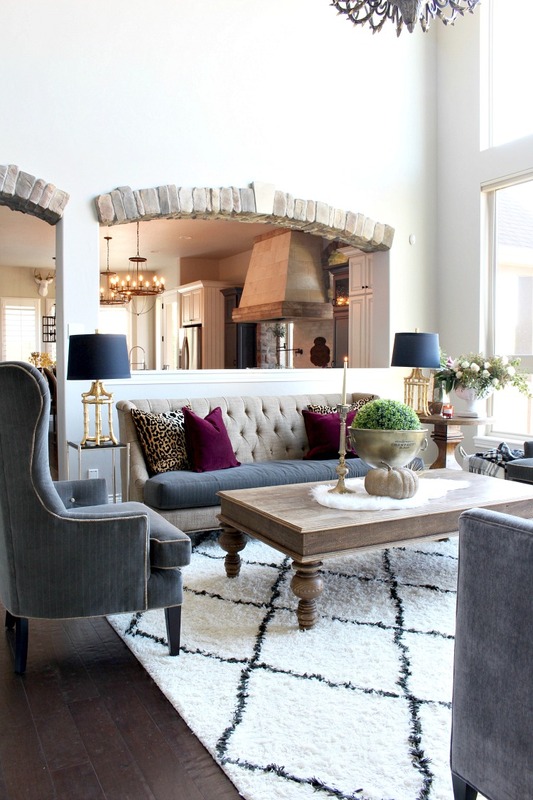 I am loving all the colors, textures and unexpected little touches. Like the thread spools! so cute!